Windows file servers contain critical information that requires protection. That's why file server auditing is imperative for any organization. By auditing all file and folder-related events, you can ensure file server security while meeting compliance requirements. While native auditing can provide information regarding who accessed what, when, and from where, sifting through volumes of event logs is cumbersome. Circumvent this time-consuming process with the use of a real-time Windows file server auditing tool like DataSecurity Plus. Content and location change events: Track all file and folder events such as create, modify, overwrite, move, restore, rename, and delete events. Security permission change events: Monitor file and folder permissions, owner and SACL changes, and identify unauthorized changes. All failed attempts: Monitor failed attempts to read, write, or delete a file or folder. Read-only events: Track events where a file or folder was accessed but not changed. Detect access trends with the Access Analysis report. Get a summary view of what's happening in the file server with the following sub-reports: most accessed files, most modified files, most accesses by process, most accesses by user, files accessed after N days, and files modified after N days (where N is defined by the user). Automate email delivery of reports at specified time intervals. Export reports to multiple formats, such as CSV, XLS, PDF, or HTML. Define an open-ended time range for reports. The File Analysis report helps isolate files that are old, unused, unmodified, large, hidden, or non-business; making data cleanup easier. The Disk Analysis report provides visual insight into disk space usage and trends, facilitating optimization of disk space; it also reveals properties of files and folders. 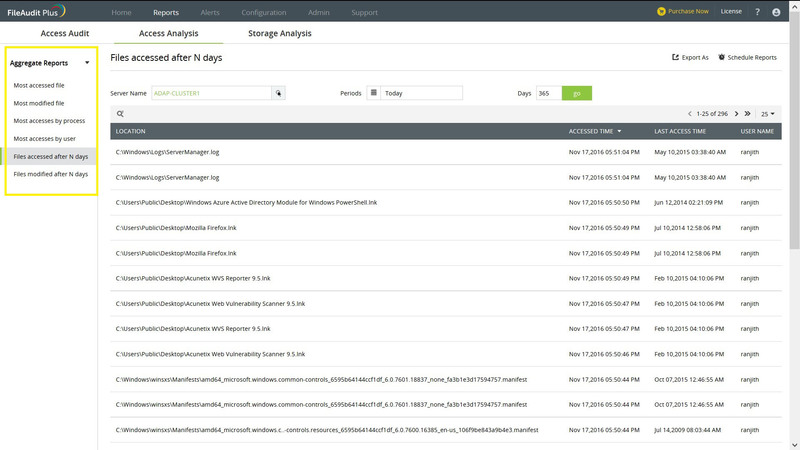 Detect security breaches as and when they occur with alerts that get emailed instantly. Define threshold limits for mass access events such as malware attacks.